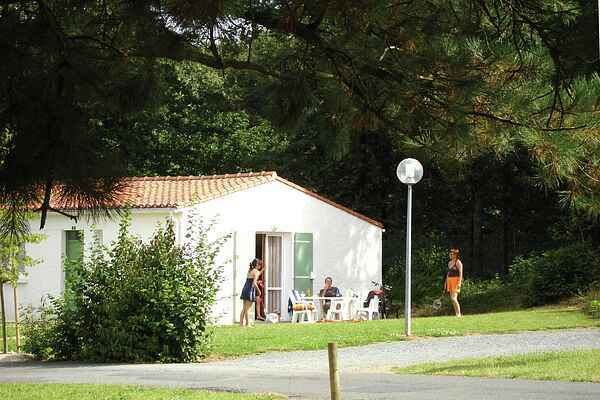 Holiday park Village Vacances de Chantonnay consists of 40 semi-detached houses spread over the park. You can choose from two types of accommodation. They are neatly furnished with a living room and sleeping facilities, kitchen with combi-microwave, bathroom with a shower and a separate toilet. They each have a private patio with garden furniture. There is a semi-detached holiday home for 2-4 people (FR-85110-04). This type has a bedroom with two single beds and a bathroom with a shower and a separate toilet. You can also choose a semi-detached holiday home for 4 to 6 people (FR-85110-05). This type has two bedrooms, both with two single beds. There is also a bathroom and a separate toilet.